New York Bites — Day Five | Eat.Drink.Life.Love. We only had one Friday during our New York visit so we figured we should kick-start the weekend. But the day was grey and cold and windy and we felt twitchy and unsettled after our visit to the site of the World Trade Center. We ate lunch at a local panini place across the street and, despite the bustle of construction and office workers going about their daily business, the whole area felt like it had a dark cloud over it — not hope, good spirit and redemption as I wished it would have felt. We shook it off and took the ferry to Ellis Island, cruising past Lady Liberty on our way. Ellis Island was fascinating and it boggled my mind that my great grandfather saw the same sights as he came into this country as we saw that day. If you participate in no other “tourist” activity in New York City, we would both highly recommend Ellis Island. After a walk around Wall Street (blah), we bundled up against the weather and headed for a fabulous Friday night dinner. Morimoto — in Chelsea/the Meatpacking District — is definitely reflective of its namesake Iron Chef. It is as large as the chef is intimidating. The staff is precise, but very friendly and accommodating. The architecture and decor are beautiful and exacting. The food was beautiful and classic, but with amazing playful twists. K and I shared two starters: Smoked salmon “ravioli” with dill foam and salmon roe and lobster fritters with citrus aioli. The salmon ravioli arrived buried under foam, we weren’t even sure it was in there! 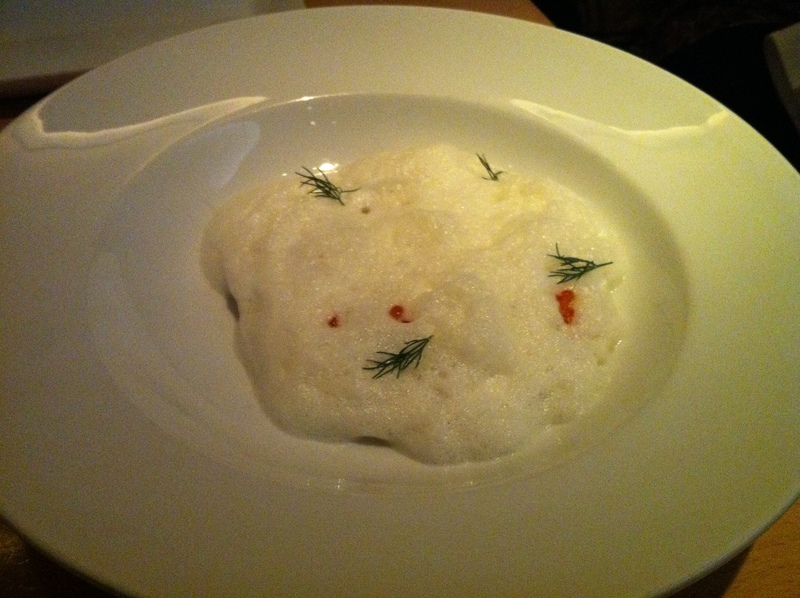 But the foam was diaphanous and had just the slightest hint of dill (thankfully, since it is not my favorite herb). The salmon was smoked and plush and the entire dish was light as air. The lobster fritters were hot, perfectly fried (no grease) and accomplished an amazing feat — an impeccable, sweet chunk of lobster was encased in the batter, but the two didn’t seem to be touching one another. Delicious! And the citrus aioli added just the right amount of creamy zest. 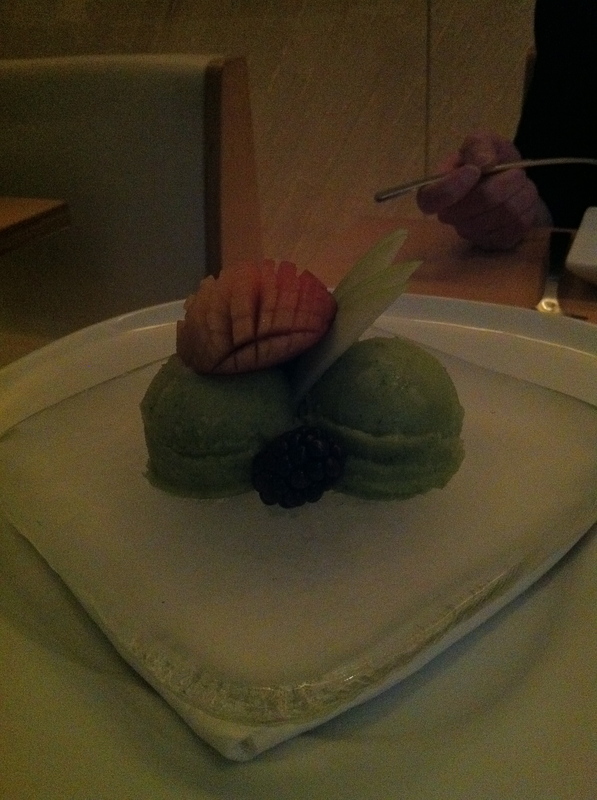 As for our entrees, K had the big score of the night with his sea bass and avocado tempura. 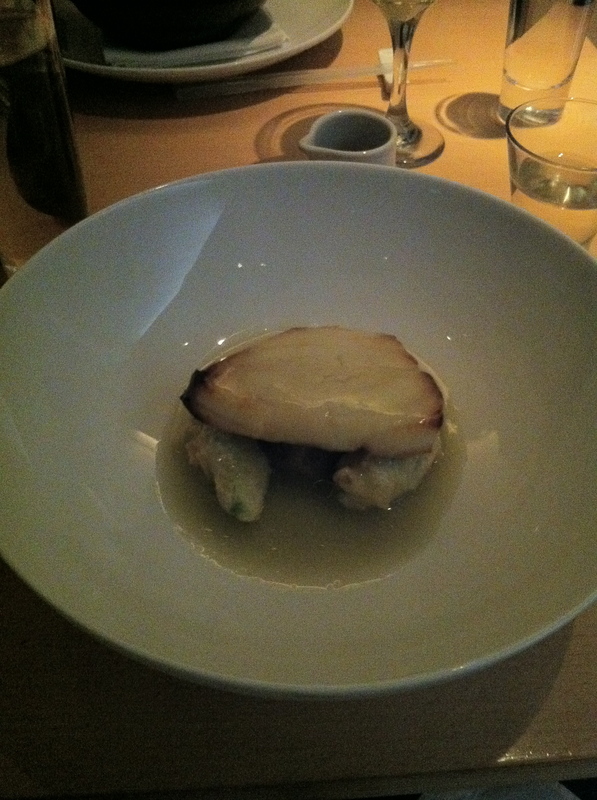 The fish was like butter and appeared lacquered with the accompanying broth. I’d eat avocado tempura all day, every day — it’s like crisp fried whipped cream! UPDATE: After looking at the menu on the website, it turns out what we thought was avocado tempura was actually Japanese eggplant tempura. Anyone who can make eggplant taste like that kind of heaven is some sort of magician. For the record though, I’d still eat avocado tempura all day, every day. My entrée was also great, but paled in comparison to K’s home run. I had the yellow tail tuna buri bop. It’s a hot stone bowl with rice, veggies, an egg and raw tuna. 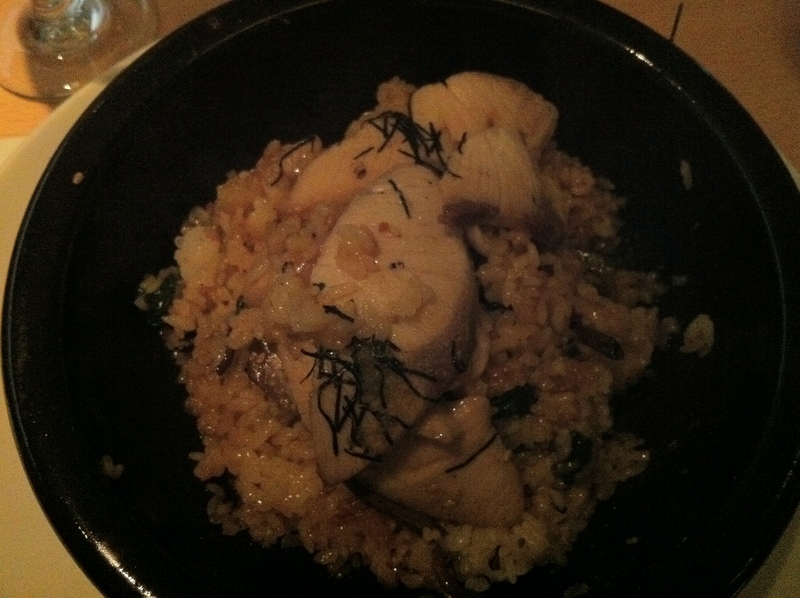 The server put the slices of fish along the side of the bowl while mixing the ingredients in the middle into fried rice. The fish was cooked well, but had a very strong fish taste. The rice had a good crust to it, but it was a pretty tame dish. Tasty, but nothing super exciting. Dessert was another exercise in tempting the taste buds. The pastry chef had created a basil lime sorbet for the evening and it was presented on a block of ice. The sorbet was strongly flavored — bold lime crashed into anise basil, all to great effect. The flavors were so aggressive we could have gone with just one or two scoops instead of three. But my favorite dessert, in the top two of our entire trip, was the soy milk souffle, tofu cheesecake and maple ice cream with maple sauce. The soy milk souffle was hot and puffy and had such a creamy, mild nuttiness to it we wanted to drink it! The tofu cheesecake (which, it turns out, contains no tofu, but more soy milk) does have the texture of clouds of whipped tofu, but with a gentle sweetness. 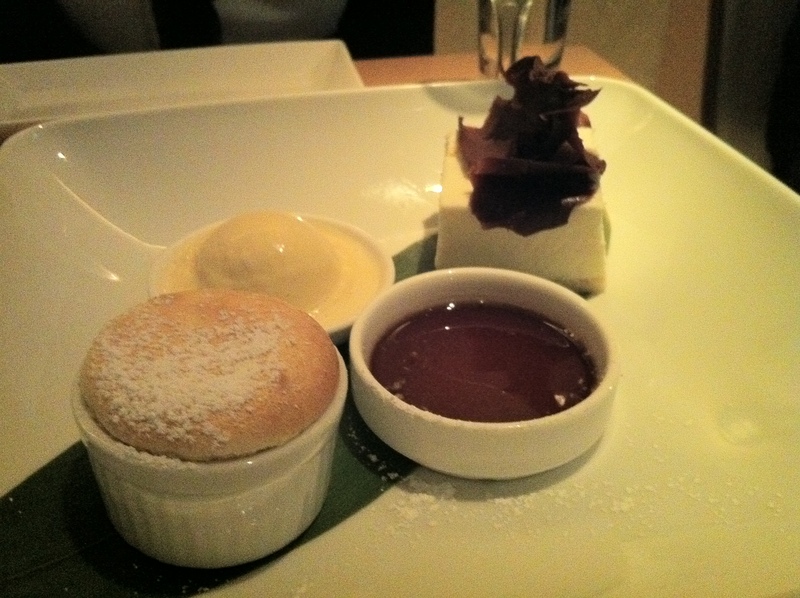 The maple sauce and ice cream were sweeter than the desserts themselves and were charming accompaniments. 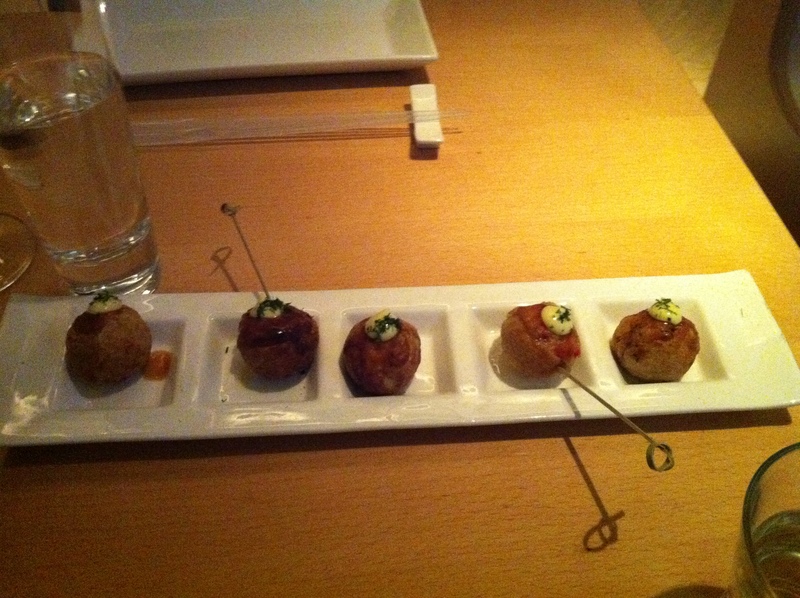 Eating at Morimoto was like a fun adventure meal, the world’s classiest “happy meal,” I guess. The food gave a peek behind the chilly exterior of Morimoto into the place where he’s giggling quietly because he threw you a culinary curve ball and you loved it. Pingback: Za Jan Noodles — Iron Chef Night « Eat.Drink.Life.Love.